SKOKIE, Ill., Aug. 21, 2018 /PRNewswire/ -- Professional Remodeler magazine has named AZEK's Impression Rail to its Top 100 Products for 2018. This highly competitive list features readers' most clicked-on and requested products from the past year. 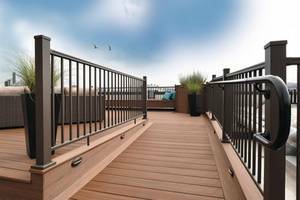 Impression Rail, a powder-coated aluminum railing system with the look of wrought iron, recently added Bronze to its color palette. Unlike most awards programs, there are no formal entries required for Pro Remodeler's Top 100 nor is there a panel of judges. Instead, the outlet tallies up reader engagement for all products featured in the magazine over the past 12 months. Products with the highest engagements are then sorted into 10 categories for reader convenience. "We are thrilled to have Impression Rail honored by Professional Remodeler readers as a Top 100 Product," said Rob Cappucci, Director of Product Management for AZEK® Rail. "This recognition sets the stage for our recently introduced Impression Rail Express™, which integrates a new interlocking technology to hide all welds and fasteners and provide clearer sight lines." Like Impression Rail, Impression Rail Express offers homeowners an aluminum rail option with wrought-iron aesthetics. At the same time, both profiles are engineered for strength and safety for worry free outdoor entertaining. Both railing systems are easy to install with no special tools required. For more information on Impression Rail and Impression Rail Express visit www.azek.com/products/railing.